Die sanfte Gleichgültigkeit der Welt (The Gentle Indifference of the World) is a short novel that takes place, for the most part, in Stockholm. Lena, a young Swiss woman, finds a note inviting her to a meeting, and when she arrives at the meeting point, she finds an older man waiting for her. Christoph is also Swiss, but the reason for his invitation is related to something more important than their nationality – he has a tale to tell her. The focus of his story, apart from himself, is a young man, Chris, who just happens to be Lena’s boyfriend, and the more Christoph talks about himself and the younger man, the greater the effect the story has on Lena. You see, Chris seems to be a younger version of Christoph, living the life the older man experienced sixteen years earlier, to the extent that Christoph knows things about Lena that nobody but Chris should ever know. However, once this shock wears off, Lena starts to ponder the real reason for this extended conversation – what exactly does the stranger want to tell her? 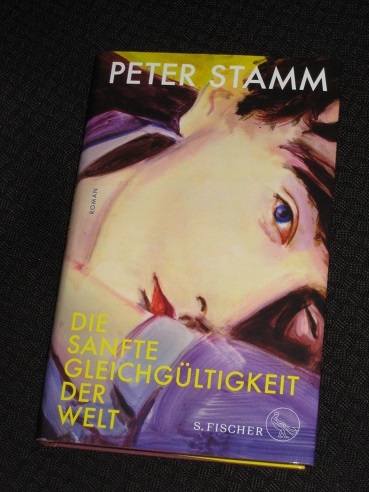 Stamm delights in stories of existential numbness and Die sanfte Gleichgültigkeit der Welt is no exception to this trend. A story on three levels, the novel begins with the walk through Stockholm, before moving on to the periods of Christoph’s life that he describes to Lena. He discusses his struggles to become a writer, the encounter with Magdalena, the love of his life, and how their break-up finally pushed him into his writing career. Endlich hörte ich eine Tür knallen und sah kurz darauf Bewegung im Flur, die innere Glastür ging auf, und ein junger Mann kam auf mich zu. Während er am Schloss herumhantierte, sah ich seinen Gesicht neben der Spiegelung meines eigenen, aber erst als er mir die Tür aufhielt, erkannte ich, dass er ich selbst war. Eventually I heard a door slam and shortly afterwards saw movement inside the reception area, the internal glass door opened, and a young man walked over to me. While he was fiddling about with the lock, I saw his face beside the reflection of my own, but it wasn’t until he was holding the door open for me, that I recognised that he was me. This is just the first meeting, and while he finds it hard to believe at first, Christoph gradually comes to the conclusion that Chris is his younger doppelgänger. The two lives diverge at times, yet over the years there’s an uncanny similarity in where they go, what they do and who they get together with, to the extent that even Chris eventually gets curious about Christoph. It’s a fascinating story, with several nods to Stamm’s first novel, Agnes, and the central theme appears to be the impossibility of living a unique life. No matter how individual we feel we are, our lives run in the same tracks as those of the people who came before us, and it can be shattering when that realisation hits home. Chris does his best to change his future while Lena’s response is an attempt to block out the truth of Christoph’s knowledge. Of course, there’s a fair amount of poetic licence here, but with his novelistic exaggeration, Stamm suggests that the stories of our lives have already been written, struggle as we might to change them. Not everyone’s a Stamm fan, and while I enjoyed the book immensely, there’s some fuel for their arguments here. His usual tropes are present in force with plenty of mansplaining to beautiful young women. The whole set-up for the story is a tad unrealistic as you suspect that in real life (if there is such a thing…) Lena wouldn’t have given Christoph thirty seconds of her time, let alone half a day. Added to this is a twist towards the end of the novel, one that makes you doubt what came before but also forces you to momentarily wonder whether Stamm is in complete control of the story. It’s a sobering thought for a man who believes himself to be in control of the story unfolding. Kaggsy – Sorry… (feels smug! ).